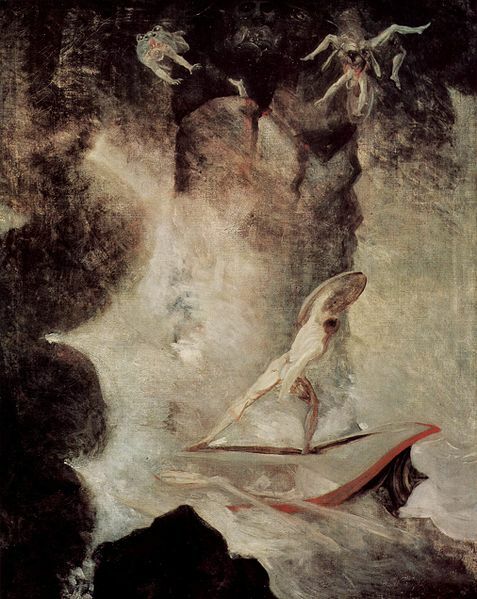 Henry Fuseli's painting of Odysseus facing the choice between Scylla and Charybdis, 1794/6. The world must have seemed a far more mysterious and unpredictable place two thousand years ago. Oases of civilization bordered on wider lands that were true terra incognita, rarely visited and poorly understood. Traveler's tales were eagerly listened to and retold by the folks at home, each repetition contributing some minor inaccuracy, some new twist or elaboration. (Perhaps we're about to experience a return to such myth-making times, as human beings begin the exploration and colonization of other worlds.) Moreover, many of the travelers themselves, eager to enhance their reputation, wouldn't have been averse to adding some extra color and vim to their memoirs. Seafaring exploits, especially, would have been embellished with more than a little poetic license. Stranger, darker things did happen at sea in far-off times because the seas and oceans were largely uncharted and who was there to dispute what lay beyond them or in their impenetrable depths? Among the many hazards said to have been faced by Odysseus on his epic sea voyage were Scylla and Charybdis, immortal and irresistible beings who lurked menacingly on either side of a certain narrow passage of water which the Greek hero had to negotiate in order to continue his journey. Scylla was an impressive twelve feet in length, boasted six long, snaking heads, and had loins unappealingly girt with the heads of baying dogs. Charybdis, on the other hand, spent most of its time skulking under a fig tree on the opposite shore. Three times a day, however, it would bestir itself to gulp down most of the waters of the passage and then belch them forth in a bloody-minded effort to make life just about as difficult as possible for any hapless seafarers. It's easy for us to appreciate now that Homer's tale of these two creatures was just an imaginative expression of the dangers facing Greek mariners when they first set out into the unknown waters of the western Mediterranean. Scylla and Charybdis were the Hellenic counterparts of the sea monsters that some medieval writers believed awaited those who ventured too far across the Atlantic. But, as it happens, Charybdis is real – if a lot less terrifying than legend once painted it. The factual Charybdis is alive and well and living almost opposite the entrance to the harbor of Messina in Sicily, in the strait between Sicily and the peninsular body of Italy. Its modern name is the Garofalo and, at times, it can pose a threat even to modern shipping. But it's certainly not the monstrous whirlpool of legend. In fact, it isn't actually a whirlpool at all because there's no circular motion of the water. The Garofalo forms when strong winds blow across the Strait in the opposite direction to the flow of the tide. This results in a violent broken swell, or unusually choppy seas, which can be rough enough to overturn small vessels and create a significant navigation hazard for larger ones. The current acquired a monstrous velocity ... The vast bed of the waters, seamed and scarred into a thousand conflicting channels, burst suddenly into frenzied convulsions – heaving, boiling, hissing – gyrating in gigantic and innumerable vortices, and all whirling and plunging on to the eastward with a rapidity water never elsewhere assumes, except in precipitous descents. In a few minutes more there came over the scene another radical alteration ... The gyratory motions of the subsided vortices seemed to form the germ of another more vast. Suddenly – very suddenly – this assumed a distinct and broad belt of gleaming spray; but no particle of this slipped into the mouth of the terrible funnel, whose interior, as far as the eye could see it, was a smooth, shining, and jet black wall of water, inclined to the horizon at an angle of some 45 degrees, speedily, dizzily round and round with a swaying and sweltering motion, and sending forth to the winds an appalling voice, half shriek, half roar, such as not even the mighty cataract of Niagara ever lifts up in its agony to heaven. Taking on the role of a modern-day Homer, Poe plays on our dread of the irresistible vortex, sucking down everything – whales, men, and ships alike – to their watery doom. In our minds, maelstrom and giant whirlpool become one, synonymous with inescapable confusion, destruction, and despair. Most recently, astronomers believe they've found such objects in the depths of space in the form of black holes: the centers of whirlpools of matter swirling round and round before finally disappearing over the edge of a precipitous gravitational well. However, the Maelstrom, like the real Charybdis, is not a true whirlpool, though its effects can be deadly enough. Located at latitude 67° 48' north and longitude 12° 50' east, the Maelstrom occurs between two of the Lofoten Islands: Moskenesoya in the north and Mosken in the south. Essentially, it's a powerful tidal current, about five miles wide, flowing along a deep marine channel between the open sea on the west and Vestfjorden on the Norwegian coast to the east. The danger to ships is greatest when the tides change, because at these times the current can reach a speed of seven miles an hour, added to which is the problem of strong, unpredictable local winds. Genuine whirlpools do exist at sea, but not nearly on the scale some writers have suggested. Among them is Corrievreckan, or "Brecan's Cauldron", off the west coast of Scotland between the islands of Jura and Scarba. Its cause: strong tides thrown into a vortex by their passage over a pyramidal rock which rises from a depth of 100 fathoms to within just 15 feet of the surface. Not surprisingly, several Celtic tales of magic and mystery are woven around it.